Since the movie "Jurassic Park", Velociraptor has become a very famous dinosaur. What is interesting is that it doesn't really look like the movie dinosaur. 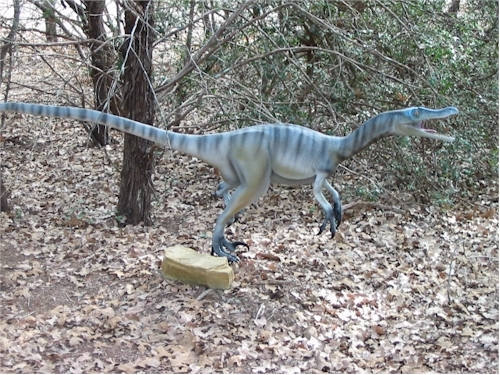 Velociraptor is much smaller than in the film and it has a longer, thinner snout. Still, pound for pound, Velociraptor was a very effective predator! One of the most unique aspects of Velociraptor is the "Killing Claw" it has on each foot. Each inside toe has a large (about 5 inches) hooked retractable claw that is controlled by a strong tendon. This claw is held upward when the animal is walking or running. However, when it attacks, the tendon snaps tight and the claw snaps down with great speed and force, slicing deeply into the victim. Not a very pretty picture, but an effective way to inflict a serious wound. Velociraptor was probably a pack hunter, which would have allowed it to attack prey much larger than itself. It also had a very large brain relative to its size - it was one of the smartest dinosaurs. It was very light and very fast, believed to be capable of sprinting at speeds of 40 miles per hour. Recent thinking is that it was also very close to being birdlike, and that it had feathers that it used both for display and insulation. It had very strong arms and claws, which were effective weapons by themselves. It had about 80 sharp, curved, serrated teeth in its long mouth. One of the most fascinating fossil discoveries ever made is of a Velociraptor locked in mortal combat with a Protoceratops. Both creatures probably died instantly in a sandstorm and their bodies were buried with the claws of the raptor in the body of the little ceratopsian, whose mouth was firmly locked on the raptors leg.